The precipitation of metal oxides from aqueous solutions creates nanoparticles with interesting solid state properties, thus building a bridge between solution chemistry and solid state chemistry. This book is the first monograph to deal with the formation of metal oxides from aqueous solutions with emphasis on the formation and physical chemistry of nanoparticles. Part I examines the mechani of condensation of aqueous cations leading to polynuclear species or lattices, and rationalizes the behaviour of cations in precipitation phenomena by identifying pathways from soluble species to solids. The cation complex is also ysed in relation to the synthesis of some technologically interesting polymetallic oxides, e.g. ferroelectric, ferrimagnetic and supraconductor materials. Part II is devoted to the surface chemistry of oxide particles. The basic concepts relating to the reactivity of the oxide-solution interface are introduced and applied to various adsorption phenomena, such as aggregation, stability of particle size against ripening, etc. These properties are exploited for the synthesis of nanomaterials for a broad range of applictions such as ceramic powders, catalysts and nanocomposites. This will also be of interest to those wishing to understand geochemical and some biological processes. 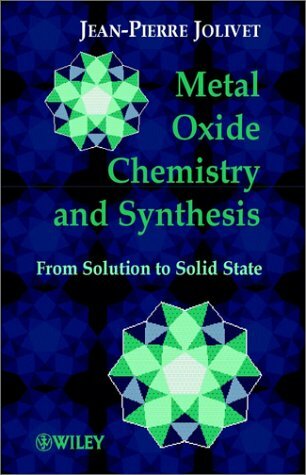 As well as being invaluable to researchers and postgraduate students of inorganic chemistry, this book will also be appreciated by solid-state chemists, materials scientists and colloid chemists with an interest in metal oxides.